"... among North America's best practitioners of Anglo-Celtic folk-rock... wonderfully intricate, powerful guitar-driven music...." ?Dirty Linen "... Lehto & Wright produce a tight, seasoned yet compact sound, offering a fresh blast of inventive folk-rock American style." ?Folk Roots Lehto & Wright have a sound that is a unique blend of traditional and modern styles. By taking cues from the Irish, English and American folk traditions and interpreting them with contemporary guitar-based arrangements, Lehto & Wright have taken a fresh approach to the world of folk and folk rock. "... Lehto & Wright produce a tight, seasoned yet compact sound, offering a fresh blast of inventive folk-rock American style." Lehto & Wright have a sound that is a unique blend of traditional and modern styles. By taking cues from the Irish, English and American folk traditions and interpreting them with contemporary guitar-based arrangements, Lehto & Wright have taken a fresh approach to the world of folk and folk rock. Lehto & Wright perform either as an acoustic duo, or a tastefully electric trio, with the addition of Matt Jacobs on drums and percussion. As a duo, John Wright and Steve Lehto perform their material in an acoustic, "unplugged" setting. From American spirituals to Irish tune sets, their accomplished twin guitar/mandolin approach has all the intensity and power as the trio with half the volume. As a trio, Lehto & Wright push the boundaries of Celtic rock, utilizing all the tools of a rock band to achieve the effect of a six-piece band with three musicians. 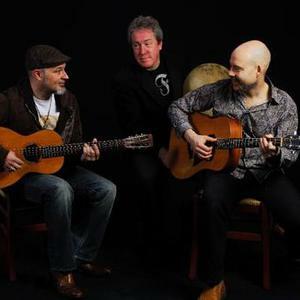 With either line-up, John Wright and Steve Lehto offer an exciting live performance of traditional and contemporary folk music with an eclectic twist. Lehto & Wright are currently performing music from their first five critically-acclaimed New Folk Records releases Ye Mariners All, The Further Adventures of Darling Cory, A Game of Chess, The Thrashing Machine and Other Stories, and Between the Jigs and the Reels, in addition to material from their upcoming sixth studio album. With a long-standing dedication to traditional music, Wright's background spans many different musical styles including blues, fusion, pop Latin and rock. By incorporating all these influences, Wright has his own unique approach to the folk and folk rock genres. This is evident in his tasteful acoustic guitar and bass work. With influences ranging from Miles Davis to Martin Carthy, from King Krimson to Richard Thompson, Steve Lehto's impressive versatility and range on the guitar is matched only by the emotion he puts into his playing. Equally at home playing an Irish jig or a jazz standard, he is a force to be reckoned with in the folk and folk rock world. Matt Jacobs resume reflects his many talents as a percussionist. From blues with Big Walter Smith, pop with The Auto Body Experience and gigs with Peter Noone of Herman's Hermits, Jacobs is a seasoned pro that understand the folk rock tradition and provides a solid foundation for Lehto & Wright. "... skillful use of electric and acoustic guitars... a fullness of sound that does justice to the tradition of the songs while redefining them." "... inspired and meticulous playing... Lehto & Wright are consummate purveyors of classic British and Celtic Folk Rock...."